War was declared on 3rd September 1939 and the two Territorial Army battalions, the 4th and the 6th, were called-up immediately. The 2nd battalion embarked for France in October 1939 and were followed by the 6th battalion in April 1940. Both managed to return to England via Dunkirk more or less intact. The 1st battalion, in India, didn't really come into action until 1942. It was the Territorials of the 4th battalion who were the first to see action--indeed it is quite probable that they were the very first British soldiers to come into contact against an advancing enemy in the field in WW2. They had been sent to Norway, but ill-equipped and without air support they had to be evacuated. 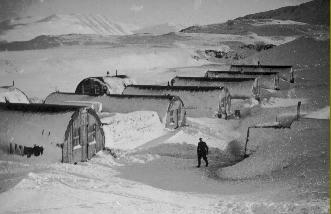 Within a few weeks they were sent to garrison neutral Iceland. They trained as alpine troops during the two years they were there. 200 men were cut off in Norway, but Major Donald Stokes of Lincoln led them to safety through deep snow, silently dodging past the enemy. They covered almost 50 miles in 2 days. Major Stokes was later killed in Normandy. The 6th battalion left for Algiers in January 1943 and had their baptism of fire at a village called Sedjenane which was lost and then regained after fierce fighting. In September 1943 they took part in the assault landing at Salerno in Italy. After a hard campaign in Italy they returned to Egypt to refit in March 1944, by which time they had lost 518 killed, wounded or missing. They returned to Italy in July 1944 and after more hard fighting they sailed for Greece in December to help the civil authorities to keep order now that the Germans had left. In April 1945 the 6th Lincolns returned to Italy and then moved into Austria for occupation duties. 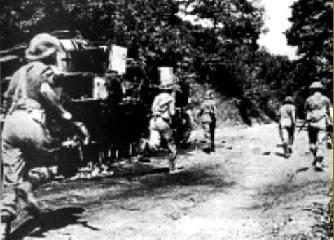 Arakan and went into action for the first time in February 1943 when they took over a section of the line facing the Japanese. After several hard fights they were withdrawn, very tired, deficient in stores and equipment and with only 350 men left out of 830. They went into action again in February 1944 and later took part in assault landings on Ramree Island and at Rangoon in 1945. Above: Men of the 6th battalion advancing after landing at Salerno, Italy in 1943. 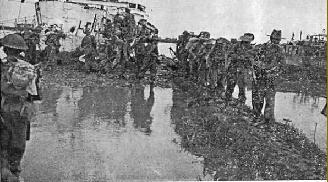 Right: Men of the 1st battalion take part in the assault landing at Rangoon in 1945. The 2nd battalion landed in Normandy on D-Day and the 4th battalion followed them four days later. Both were subsequently in heavy action around Caen. The 4th battalion helped in the capture of Le Havre whilst the 2nd Lincolns were in Holland by the end of September 1944. The 4th battalion, further west, crossed the Antwerp-Turnhout canal in the dark and in the pouring rain to secure a bridgehead for the Engineers, who quickly erected a bridge for the Polish Armoured Division. The Allied advance ground to a halt during the winter in flooded Holland, but in February 1945 the 2nd Lincolns crossed the Maas and by the 24th they were in Germany. 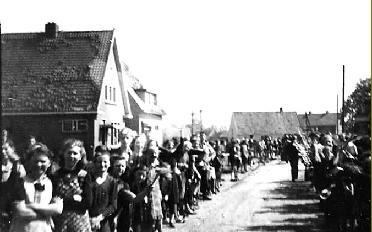 They were involved in a number of close actions and by VE Day they had reached Bremen. 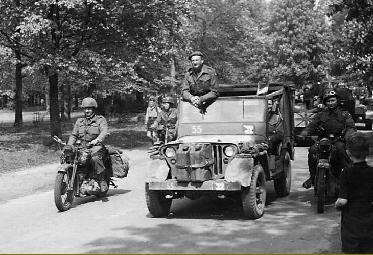 The last action of the 4th Lincolns was in the liberation of Arnhem in April 1945. Trucks move cautiously over a temporary bridge at Arnhem. Villagers turn out to cheer the Lincolns as they liberate yet another Dutch village. Right: The Lincolns enter Utrecht.